Dr. James A. DeBardelaben founded IvySys Technologies, LLC in 2005 with the vision of creating an innovative technology solutions and services firm exclusively dedicated to solving the critical situational awareness problems of the defense, intelligence, and homeland security communities. Under his leadership as president, IvySys has become a lead technical consultant to the DARPA Strategic Technology Office and the Office of the Secretary of Defense for Intelligence, Surveillance, and Reconnaissance (ISR) sensor networking, robust wireless communications, and tagging, tracking, and locating (TTL) programs. Before founding IvySys, he was the program manager for Special Operations ISR programs at the Johns Hopkins University Applied Physics Laboratory (APL). While at APL, Dr. DeBardelaben served as an expert consultant to the DARPA Advanced Technology Office and Naval Special Warfare Sea Eagle program. He also served as supervisor for Real-time Embedded Software and Tactical Distributed Systems and Networking in the APL National Security Technology Department. As the APL project manager for the NAVSEA Silent Hammer Limited Objective Experiment (LOE), Dr. DeBardelaben led the Special Operations Land Products Team that developed unattended ground sensor; an unattended land mesh network for high data rate, long-range persistent communications; and custom software applications to enhance SOF situational awareness. In addition, Dr. DeBardelaben was the lead software engineer for the Special Operations unattended ground sensors and wireless network implemented in the NAVSEA Giant Shadow LOE. Prior to his tenure at APL, Dr. DeBardelaben developed global sales and trading systems as an information technologist in the Distributed Systems Group at Morgan Stanley in New York City. Dr. DeBardelaben received a Ph.D. in electrical and computer engineering from the Georgia Institute of Technology, an M.S.E in computer engineering from Princeton University, and a B.S. in electrical engineering with honors from Brown University. He has authored more than 20 technical journal and conference papers in wireless networking, embedded system design, and rapid system prototyping. Resolving global threats such as piracy and terrorism requires nations to work together to advance a coordinated strategy. These multinational operations present a unique set of challenges particularly in communication and coordination. A common view of shared information is essential for maritime domain awareness and paramount to mission success. FOCUS: An Emergency Calling For C-COM, author: Drew Klein, Director, International Business Development, C-COM Satellite Systems Inc.
On March 11th, 2011, a massive earthquake shook the Northern coast of Japan, sending a 10 meter high tsunami crashing into the island nation. Up to 10 km inland, and across 140 km of coastline, the tsunami devastated the lives of millions of people, destroying homes, businesses and cutting critical communication lines. Almost three months later, the country continues to mourn, as residents and rescue workers comb through the immense debris field. Theres no telling when an emergency situation might occuror how severely mission-critical applications may be affected. As recent natural and man-made disasters have demonstrated, enterprises, government agencies, relief organizations, and small businesses must sustain vital communications, even in the event of a large-scale disaster. NASA researchers went on a very special hurricane hunt this past year. The six-week field campaign, called GRIP, for Genesis and Rapid Intensification Processes experiment, was one of the agencys largest hurricane research efforts. The goal was to gather new information on how hurricanes form and intensify. To do that, scientists needed to catch tropical depressions in the act of turning from loose collections of winds into full-blown hurricanes. Once they had a storm in their sights, the plan was to collect as much information as possible about its development using the latest remote-sensing technology. Communications On The Move (COTM) has gained a great deal of attention recently as the need for broadband connectivity on a mobile platform has increased dramatically in the past few years for both commercial and military applications. When assessing routers for COTM MILSATCOM operations, there are several physical layer, security and operational considerations that must be taken into account. 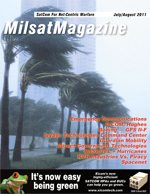 This article will look at physical, security and operational characteristics of routers that are best suited to COTM MILSATCOM operations. Helicopter operators providing emergency medical services (EMS) are currently fighting a safety battle. More so than any other aviation services provider, the pressure to fly when the conditions are less than ideal is extreme as lives are usually hanging in the balance. Unfortunately, the accident rate for these operations is significantly higher than others and the industry, encouraged by governments and industry associations, is working feverishly on many fronts to improve their record.